Before tartans became associated with royal patronage and the upper class in Britain they were banned in the Scottish Highlands. The Dress Act was imposed in 1746 and made the wearing of Highland Dress including tartans and kilts illegal. This was done to break the clan system and stop Jacobite risings supporting the House of Stuart. 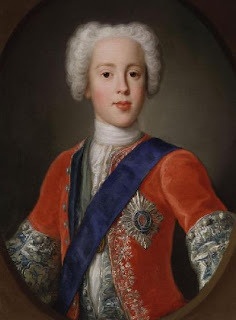 Prince Charles Edward Stuart (1720-1788) known as Bonnie Prince Charlie was considered the Jacobite claimant to the thrones of the Kingdoms of Great Britain and Ireland. The Catholic Charles, who was born to his exiled parents in Rome was supported by the Highland Clans, as opposed to the reigning Protestant House of Hanover's George II. The young prince was painted by Italian Antonio David (1698-1750), the official painter for the exiled Stuart court living in Rome. 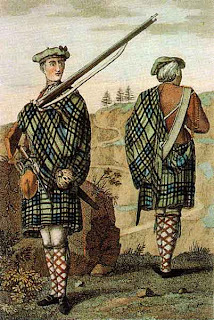 A 1744 image shows a private and corporal in the Highland Jacobite Regiment. 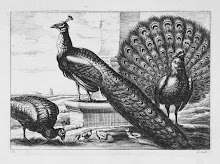 Charles and this followers were defeated by the English at the Battle of Culloden in 1746 resulting in a campaign to assimilate the Scottish Highlands by repressing Gaelic culture. 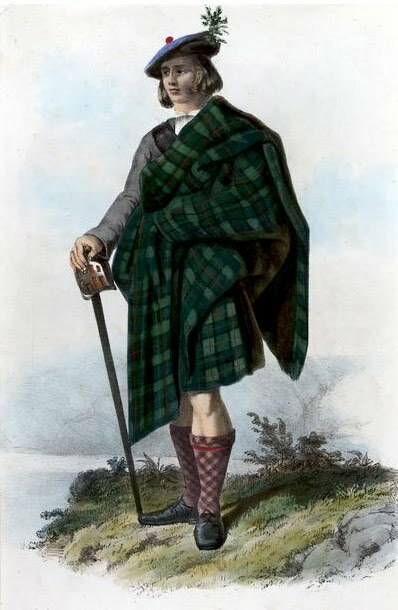 When the act was appealed in 1782 tartans and kilts were no longer limited to the Highlands but became symbolic of Scotland. In the nineteenth century the fashion was incorporated into Britain with the Highland romantic revival. Robert Ronald McIan (1803 -1856) was a Highland actor and painter who depicted Scottish clansmen in The Clans of The Scottish Highlands which he dedicated to Queen Victoria. The Queen, great - great granddaughter of George II, embraced Gaelic culture buying Balmoral Castle. Prince Albert decorated it in the red Royal Stewart and green Hunting Stewart tartans of the House of Stuart. When the royal family visited they would wear Highland dress.